Clone Wars Review: "Missing in Action"
I am going to review this episode honestly and objectively. 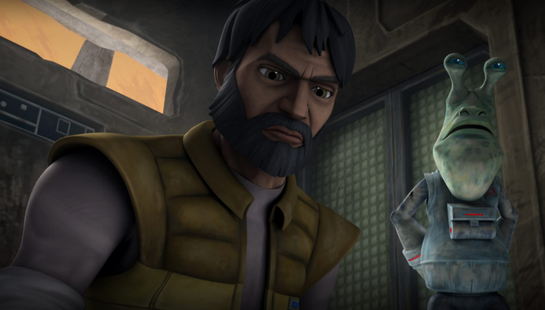 "Missing in Action" received a lot of hype since it was the 100th episode of The Clone Wars series. However, I personally think the anticipation built it up too big, because this was not the best, nor my favorite episode of the current arc. I loved the first two. "Secrets Weapons" and "A Sunny Day in the Void" both did a fantastic job of building up the characters, and getting us to the point we are at now, which is a pretty awesome one. Yet the third installment felt like a step back for me. But there were still a lot of things that I did enjoy, and I will start by mentioning them. The animation of the town on Abafar was very well done. I loved the dusty, washed out look of the place. The crew did a fantastic job giving the settlement a backwater-like ambiance with all of the active background characters. The diner was also very well done, and I thought it was interesting to hear something sizzling on the stove. The bartender, Mr. Borkus, was a clear homage to Wuher from the Cantina scene in A New Hope, and there was also a little Doctor Evazan in him as well. When he told the Colonel that he "didn't serve" droids, I laughed out loud, and I loved the twist on the classic scenario when he then added that he didn't serve Gascon's kind either. This episode was certainly a humbling one for Meebur, from running for his life from a cook with a knife to being forced to eat garbage. The banter between Gascon and WAC-47 remained witty, and their differing views on most situations made the dialog very engaging. The Colonel still seems to want to justify to himself why he is better than droids, and WAC continues to have no empathy for Gascon. It seems like they have possibly settled into their permanent character states now, able to co-operate and respect each-other, but still having unique points of view and motivations. 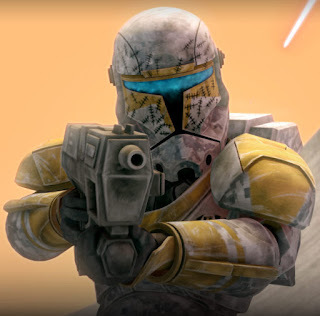 It was awesome to finally see a Republic Commando in action. Gregor definitely lived up to my expectations as far as how cool he looked. The reference to Gerry Cheevers in his armor was great. Yet I found his personality a bit rushed. This is where I will start delving into the things I found lacking in this story. There seemed to be a confusion about who the story was really about. It would have been great to continue developing Gascon and D-squad, and only use Gregor as a cameo with an epic punch, but I did not feel like we were taken any new places with the old characters. The only scene that I found really insightful, was the one when the Colonel discussed the lost battle that Gregor fled from before losing his memory. Hats off here to the animation team and voice acting, because only from Meebur's facial expressions and tone of voice, could I read between the lines of dialog and tell there was something deeper going on. It is my guess that Gascon was the strategist in that battle, and feels some responsibility for the fallen Commando's predicament. This gave me added sympathy for Gascon, casting him as a tragic figure. But Gregor himself was too shallow to carry the story, which seemed cliché. It was almost like a quick parody of a classic fairy tale. Gregor was like a cross between Sleeping Beauty and Cinderella, a pure character destined for greatness who was being held down by evil circumstances, and had to realize his true self to break out. I found his antagonist, Mr. Borkus, to be way too over the top. His endless maniacal cackling at one point was very unnecessary and out of place, as was his unexplained vindictiveness. I would have loved to see Gregor's story be fleshed out a bit more, either by spending more time on developing his character in this episode, or showing bits and pieces in previous ones to grow him along with his hero counterparts to this assumed yet most likely deceptive climax. It would have been great if Gregor had actually failed a few times to combat the droids, giving his triumph more weight by contrast. Simply making him epic after putting on the helmet --especially without much prior personal struggle-- was just too quick to make me emotionally attached to the character. Despite these things, I still liked the way his sacrifice was orchestrated at the end. At first I thought he was going to make it out alive, and was looking forward to seeing more action from him in future episodes, then was depressed to realize his position was more dire. His stand reminded me of Hevy's and Master Di's in previous seasons. However unlike the first two, his fate was left open to interpretation, which I really appreciated. In conclusion I enjoyed this episode, but did not like it as much as the previous two. Yet I still think the show is on the right track. The Clone Wars has been very dark and political lately, and I like how George Lucas is still infusing a more fun, Saturday morning adventure vibe to balance things out. Because of this, I still am looking forward to the next episode, even though this one didn't leave me with anything specific to expect. "Missing in Action" may not have been a shining star, but I still definitely want to offer my congratulations to The Clone Wars team for reaching 100 episodes and still going strong! It is a real accomplishment, and it has been so awesome these past 5 years having Star Wars on TV every week. I cannot wait for this season to really ramp up! I think the action at the end was worth the slow pace of the episode, even though I agree some scenes were just way over the top and unneeded, like the Diner owner's laughing. And why exactly was he all of the sudden Dr. Evil? LOL!